This is a particularly important ever-present question for Camino pilgrims. The first level of rejuvenation is restoration, to restore the physical body and the spirit back to a level where the pilgrim can set off and walk again the next day. Most albergues, or pilgrim hostels, will only allow one night’s stay, except in cases of extreme physical hardship, so pilgrims must get up and move on. It would be a supportive, loving, and respectful practice for ourselves, at the end of each day, to take stock and see what needs restoring to get to the essential baseline of vitality and well-being to “walk the day” tomorrow. I don’t know about you, but there are some days when I begin with a deficit, carried over from the day before. There have even been times when that deficit accumulates until my body says “no” and stops me with some clever and effective physical malady. 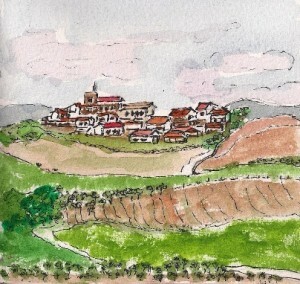 Being on the Camino pilgrimage teaches us the necessity of daily-stock taking, restoration and (italics) rejuvenation. This practice isn’t optional it’s essential. If we don’t tend to it, at some point, (and it doesn’t take very long) we can no longer get up and walk. So, tonight, I’m asking myself, What Needs Restoring? And, What Will Rejuvenate Me? I’m curious about the impact of this practice on my day-to-day life. I invite you to love and respect yourself in the same way tonight.